I always appreciate your compositions.. so vivid! Thats's a pretty impressive piece of work. very dynamic. Wow !!! When i saw this my brain says wow ! Looks a bit like the cover of the first issue of SuperMan comic book. The Google monster! Fantastic work! Don't suppose we'll be seeing this as a version of the Google logo anytime soon though - shame. Excellent job. Can you tell me what media you use? Dude! I saw this via Tin's blog and then BLAM! It was all over Gizmodo.com! OMG just wanna say that I'm a huge admire of your art and that this is absolutely gorgeous!! Keep it coming! thx Nila! 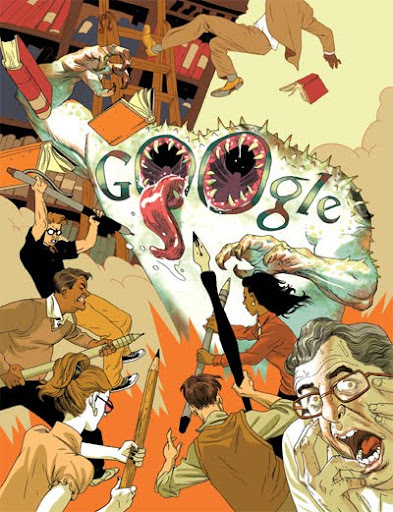 but this illu is by Asaf, not Tomer... i'll pass on the good word. Awesome!!! 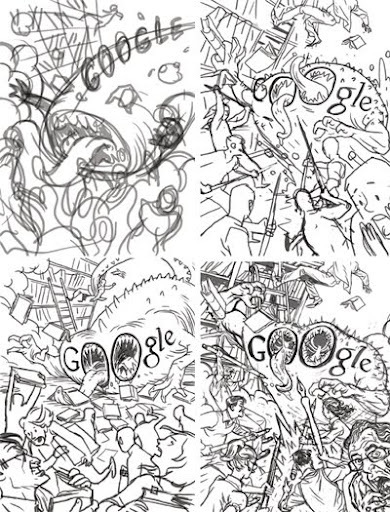 ...your drawing that is, not the fact that Google is actually a monster! Fantastic design by the way! Great piece!I think this is one of my favourites of yours Asaf. Super! It looks like a movie still... and I would really, really, really love to see THAT movie! I LOVE the face of the guy in the rigth corner. great work! Whaooo !! I love your blog and Art !! it's wonderfull ! I think only publishers are protesting this. I don't see how authors would be adversely affected. This looks like a lot of fun was had by all -- excellent! i want to buy it as a poster.... how? Whao! I love your blog and Art! it's wonderfull work!